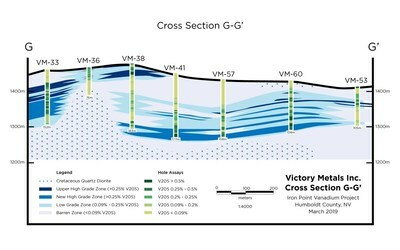 VANCOUVER, April 10, 2019 /PRNewswire/ - Victory Metals Inc. ("TSX-V:VMX") ("Victory" or the "Company") is pleased to announce final assay results from an additional 17 reverse circulation ("RC") holes completed at its Iron Point Vanadium Project, located 22 miles east of Winnemucca, Nevada. Victory has now released results for all 69 RC holes from a planned program of 69 RC holes and 4 diamond drill holes. The 17 RC drill holes reported today include both vertical and angle holes that were drilled in the southern extent of the historically identified, vanadium mineralized zone (see Figure 1). In addition, several step-out holes, which are step-outs to the south of the historic zone, encountered vanadium mineralization that significantly expands the mineralized system in this direction. As per earlier released results, this drilling continues to demonstrate strong vanadium mineralization grades and continuity. Based upon the continuing footprint expansion of vanadium mineralization, Victory has added 96 claims or 1,800 acres to the Iron Point project. The extent of the property area now totals 690 claims or 13,300 acres. 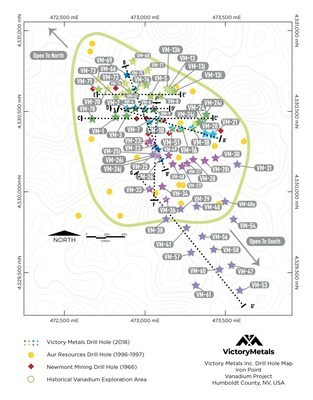 Vanadium results from a number of the currently released drill holes are plotted on a north-south section (see Figure 2, Section G-G') and continue to demonstrate the strong continuity of mineralization in flat lying zones that extend over a large area. Continuity of mineralization in both the lower grade vanadium envelope and the two high-grade zones continues to be strong as drilling extends throughout the southern portion of the historical vanadium mineralized zone, and steps outside of that zone to the south. As indicated in the five sections released to date (Sections A-A', B-B', C-C', F-F' and G-G'), the Upper High Grade and New High Grade Zones as well as the broader envelope of vanadium mineralization has now been drill defined over an area exceeding 1,200 meters north-south and approximately 700 meters east-west. Collin Kettell, CEO of Victory, stated, "Today's drill holes mark the completion of the reverse circulation holes from Victory's maiden drilling campaign and results have exceeded our highest expectations. Our initial concept around confirming historical drilling has been greatly enhanced in terms of size of footprint, which now exceeds 1,200 meters north-south, and in terms of the distribution and continuity of vanadium grades". Assay results for intercepts released today are reported in % V2O5. Intercept lengths are deemed to be true thickness given the flat nature of the mineralized zones being tested by vertical holes. Intercept lengths are reported as an Overall Length, which includes all assay intervals within the vanadium blanket zone (at a 0.09% V2O5 minimum grade), and also as individual zone intercepts reported as aggregate lengths comprised of samples grading 0.25% V2O5 and greater. All intercept lengths have been reduced to true thickness lengths as currently defined by the dip of mineralized horizons shown in Figure 2. Drill hole VM-22 returned no significant values. Drill hole VM-40 was lost at shallow depth and replaced by VM-40a. Drill hole VM-25a was a shallow twin of the upper part of VM-25, testing center return sample results against standard hammer. Drill hole VM-41 bottomed in 0.64% V205. The Victory drilling program was directly supervised in the field by the QP and other site geologists working for Victory. All samples were split at the drill site using a Gilson bar splitter and Jones riffle splitter, with two samples per 5-foot (1.52m) sample interval collected and placed into heavy plastic bags together with sequentially numbered sample tags. A 2kg sample was collected for assay, while a 4kg reference sample was kept on-site. Three different vanadium standards (71 ppm V, 320 ppm V, and 5172 ppm V) and coarse blank samples were purchased from Minerals Exploration and Environmental Geochemistry (MEG) Inc. of Reno, NV. Victory site geologists inserted field blank, standard, and duplicate samples into the drill sample stream per NI 43-101 guidelines, maintaining a 1-in-20 insertion rate for each of the field blank, standard, and duplicate samples such that every 7th sample is a control sample. Field duplicate samples were split from the 4kg reference samples using a Jones riffle splitter. Drill samples were transported by Victory personnel to locked storage sheds rented by Victory and located in Golconda, NV, about 14km west of the project area. Samples were picked up in Golconda by American Assay Laboratories utilizing its own truck and driver and transported directly to American Assay's facility in Reno, NV. At American Assay Laboratories, the samples were crushed to 70% passing 2mm, and then a 0.3km split was ground to 85% passing 75 micron. A 0.5gm split was digested in a 5 acid process (ICP-5A035 method uses HNO3, HF, HClO4, HCl, H3BO3) and analyzed via ICP-OES. The detection limit for vanadium is 1ppm, the upper limit is 10,000ppm, and sample results are reported in PPM V. As a separate QAQC check, American Assay inserted laboratory standards, blanks, and duplicates into the sample stream. American Assay Laboratories is accredited by the International Accreditation Service, which conforms with requirements of ISO/IEC 17025:2005. Victory is currently using ALS Chemex in British Columbia to perform umpire assays on 1-in-20 drill pulps obtained from American Assay Laboratories and submitted to the ALS Chemex facility in Reno, NV. ALS Chemex employs a four-acid digestion process (ME-ICP61m method), so Victory is re-numbering the pulp samples and inserting the same field standard samples into the sample stream in order to better compare results between the two labs.